Many industries have embraced power washers to improve employee safety and the print industry has also joined the ranks. We know what you're thinking; Print industry? Fabrics? Pressure washers? What gives? For those of you unfamiliar with silk screen printing on fabrics, we'll give you a brief overview on how pressure washers factor in. Screen Printing — What's Involved? Screen printing, sometimes referred to as Silk screen printing, has been around a very long time and is a process in which pigments are transferred to fabric in a specific pattern. 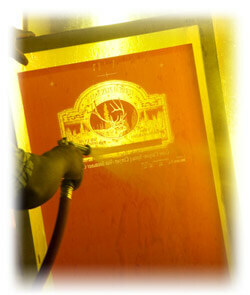 Many T shirts and fabric designs are created using a process called silk screen printing. Silk screen printing involves different inks being applied to a wide array of substrates ranging from textiles to plastic, wood and metal components. It's a time consuming, messy process but it delivers the goods. One of the challenges of silk screen printing is cleaning up. There are a number of components to cleaning up the silk screens — ink needs to be removed, emulsion and haze need to be removed as well and the screen needs to be degreased. Originally, these screens were cleaned by the application of solvents which helped remove inks, haze and emulsions. Haze is caused by pigment left on the screen that bonds with the resin after the solvent evaporates. This work frequently required forceful scrubbing in a washout area which posed a health risk due to skin absorption and inhalation of the cleaning chemicals. These chemicals were typically methyl ethyl ketone, terpenes, mineral spirits, xylene, heptane, toluene, hexane and glycol ethers. Some of these are volatile toxic organic compounds that can pollute the air. Mineral spirits, which contain trace elements of toluene, xylene and benzene is risky as well. Because of the potential health risks (Hexane has been associated with peripheral neuropathy and ethyl ketone has been found to be associated with the use of cleaning chemicals for silk screens, some screen printing companies have developed a high pressure screen reclamation process which greatly minimized the use of chemicals. Wastewater treatment and chemical exposure were also reduced. Let's take a look at your options to accomplish the clean up. The Screen printing cleaning process involves four steps: ink cleanup, removal of emulsion or stencil, dehazing and degreasing. Proponents of using pressure washer screen cleaning point to three advantages: Screens are much cleaner due to a more focuses and effective method of cleaning; Less labor and time were involved to clean the screens and substantial money saved by using far less chemicals. further damage and of course, using the pressure washer or the sprayer wand improperly can cause damage. Ordinarily, large screens take time to clean which is why some large format shops often purchase a large, high-volume pump system with a spray nozzle pressure of 1,250 psi or higher. Some sources recommend 1000-1500 PSI to properly blow the emulsion out after the emulsion remover has been applied to the product. Most washout booths come with an angled support shelf for silk screens in addition to having having back lights. Large format screen print companies usually have stainless sinks or even complete rooms with floor drainage surrounding a central cleaning area used for suspending screens or leaning screens against supports. This allows pressure washing to be performed in a complete 360 degree sweep without lifting and moving the large frames. If you are new to pressure washing, keep in mind there are a number of safety considerations. If you are unfamiliar with safety guidelines, we suggest reading power washer safety tips to educate yourself. The same four chemical work phases are common with all types of ink, but the required chemistry for every ink system is specific. In most cases, the frame is usually placed in a dip tank for around 20 minutes. The time in tank varies depending on the strength of the chemical. Biodegradable chemicals are usually used for dissolving ink and a specialized chemical solution, typically a low strength acid solution, is used during the emulsion removal part of the screen printing cleaning process. Virtually no stencil removers are capable of giving good results without the use of a pressure washer to blast away the loosened emulsion. A caustic-soda solution with moderate strength mixed with a light solvent is frequently used in removing haze. Dehazing will sometimes make the last step, degreasing, a moot point since many dehazers are capable of eliminating oils from the mesh. If these substances are not removed, then a finished Tee shirt or fabric may look substandard. When working with delicate objects like screens, it is best to leave this to professionals or to do research to make sure you are well aware of what you are getting into. When working with dangerous and toxic chemicals, always observe strict safety procedures and wear appropriate safety equipment like goggles and gloves. If you have any questions, please don't hesitate to contact us at info@ultimatewasher.com. Pressure washer is a must when it comes to cleaning your restaurant. Importance of a power washer in the upkeep of recreational areas.